Email has unified with many other technologies to become indispensable means of communication for business. Email needs to be secure, reliable, fast, and mobile. Many organizations have expanded faster than their email system can manage. Delays, lost email, retention policies, and spam can frustrate business operations and have costly results. JR-Tech can perform an email migration not only to new hardware, but can transition it to better solutions that work for your company. These solutions range from internal email hosting, external hosting, cloud hosting, and managed data centers. 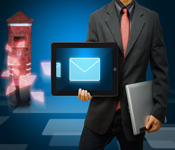 We are experts in every major email technology available, and many custom technologies. We can merge multiple email platforms into one, or divide solutions to provide better redundancy. We can help you plan your email retention policies, and ensure your systems will handle your business’s future growth.